Each morning when Kaelyn takes a bath, we will remove her mask, take the oximeter sensor off her and take off her continuous feed as well. 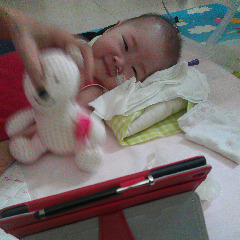 This is 1 short moment for the day where she will not be attached to any machine. She is pretty glad not to be attached to any machine. And we do feel her gladness for this short while of freedom for her. The temporary disconnection from the equipments, especially the oximeter, also does makes us feel insecure as we do not have the reading from the oximeter to indicate if her respiration is fine. We have to rely on Kaelyn’s facial expression and cues to judge if she is fine. Today, her numbers are quite fine today, so we decided to take off her mask for an hour. But she still has the oximeter sensor on, so we are pretty fine to let her off the mask for an hour. Her O2 sats maintain fairly well throughout this hour, considering she has been on the mask with the BiPap machine assisting her breathing. Although there were short dips of 1-2% below the recommended level of the O2 sats of 95%, but she pick it up fairly promptly without any assistance or oxygen. Respiratory rate looks reasonable and not too laboured. Pulse rate were within range. Facial expressions were that of cheerfulness! And she was playful too. Given her underlying condition and what’s happened in the hospital, her baseline of her respiratory functions has dropped and may never recover ever. But we still hope we are able to wean her off the mask. But of course, we are not pressing hard nor in a rush to do so. Anything signs of improvment are always welcome.